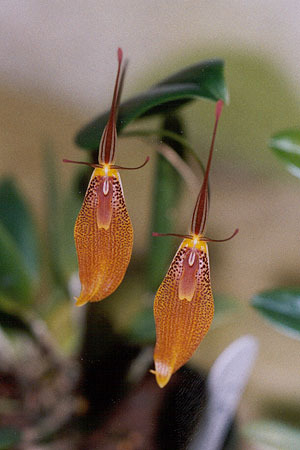 The Restrepia orchid genus is a close relative of Pleurothallis. The lateral sepals are fused into a large synsepal, with a small labellum on top of it. The lateral petals often resemble antennae, and usually have a small bulge at their tips. The narrow dorsal sepal also has a bulge at its tip. They are most commonly yellow and/or red orchids, often with the colors alternating in striped patterns. The flower stem emerges from the base of the leaf, and bears a single flower. They don't bloom seasonally, as most species are equatorial; larger specimens can bloom year-round with proper care. They sometimes form keikis at the base of the leaf, which is an easy way to propagate them. Like most pleurothallids, they like a lot of humidity; in fact, they like more humidity than most pleurothallids. Provide 70-100% humidity; 100% is ideal. They grow as epiphytes in cloud forests in the Andes where they live up in the cloud layer and never really dry out. water whenever they approach dryness, but ideally keep the humidity high enough that they only dry out slowly, if at all. Fortunately, these orchids have a less rigid humidity requirement than most pleurothallids, so you can get away with somewhat less humid air if necessary. They do best with cool temperatures; for most species, 68°F (20C) is the maximum temperature I recommend, but again the temperature requirements are less rigid than for most pleurothallids. There should ideally be a 10-15°F (6-8C) drop in temperature at night. Intermediate light, about 2000 footcandles, is reasonable. They'll also be okay with lower lighting like you'd use for a Phalaenopsis orchid. As with other pleurothallids, more light means they need cooler temperatures and vice versa. Reasonable potting mixes for these orchids include fine fir bark, and New Zealand sphagnum moss. You can also grow them mounted on a stick or a slab of bark, with a little moss around the roots. They rapidly grow into large specimens if you keep them happy, so if you grow them mounted make sure to put them onto something large enough to accomodate this growth. The easiest way to provide the humidity and temperature control they need is usually in an orchidarium.